Local perforations are usually neglected. There are two main reasons, I think. First, they are usually rare - an exception would be local perforations on stamps of Estonia 1918 - 1920. Second, partly because of this, it is often difficult to establish whether a perforation was the work of a post office (a "Postmaster provisional perforation") or the work of a private company (which wanted to speed up work in its post room) or the work of an enterprising philatelist who saw the chance of creating a variety. 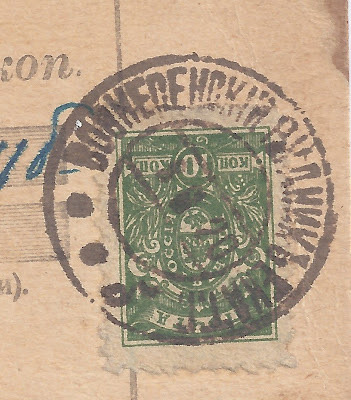 The perforated Denikin stamp shown on the Money Transfer Form above is likely to remain a puzzle. It is being used in the Soviet period, revalued x 100 times. 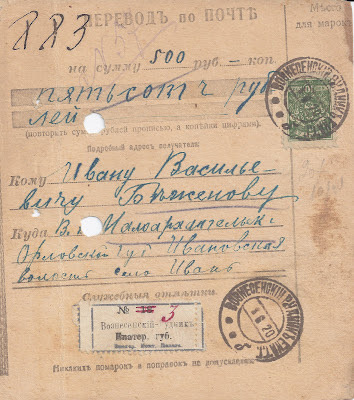 It has a heavy strike of the postmark of VOZNESENSK - RUDNIK, EKAT [erinoslav] 8 6 20, tying it to the card in such a way that it rules out any kind of manipulation of the stamp after use. 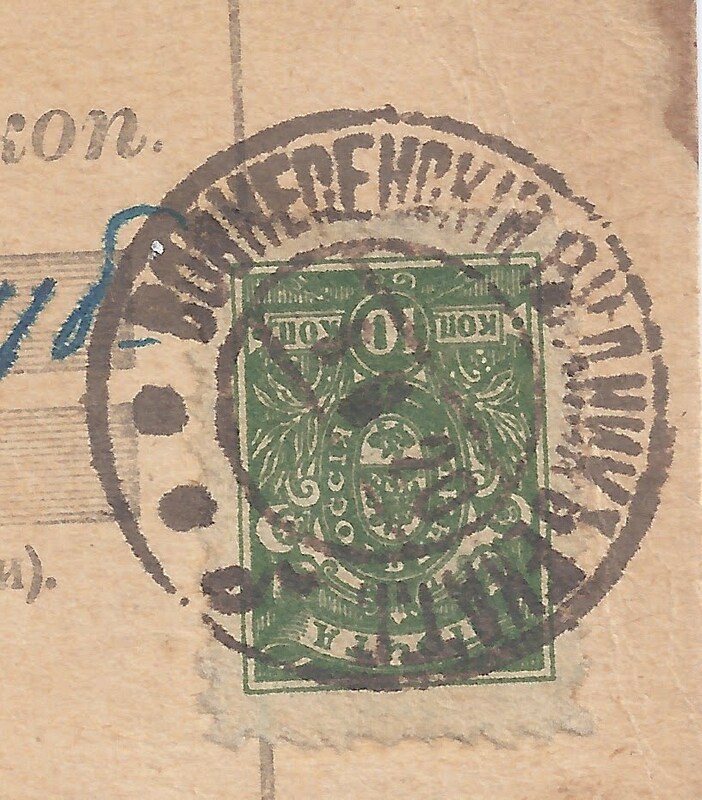 It is being used in an area of Ukraine occupied by Denikin's forces, so is a stamp left behind and now used as a Trophy stamp. 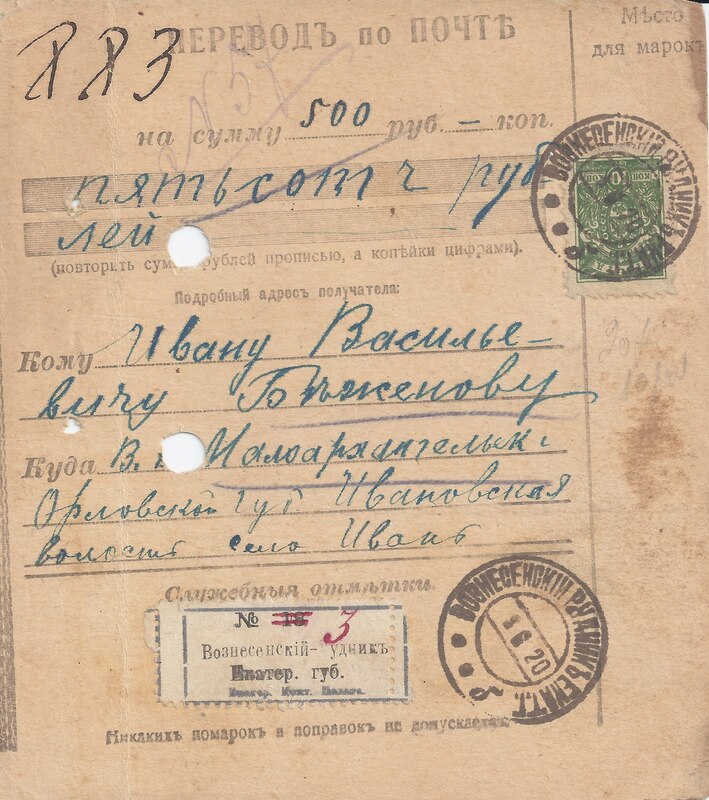 The card is addressed outside Ukraine to Ivan, Orlovsk where it did indeed arrive 15 6 20. It is perforated 9.5 - 10, so not the gauge used for officially perforated rouble value Denikins. So who did it? The postmaster in this small office? It seems unlikely. But who else? The only way to begin to solve the puzzle is to find more examples of low value Denikins perforated like this and maybe cancelled from the same office. Out there, such stamps probably exist, since when you perforate stamps you perforate sheets of them.